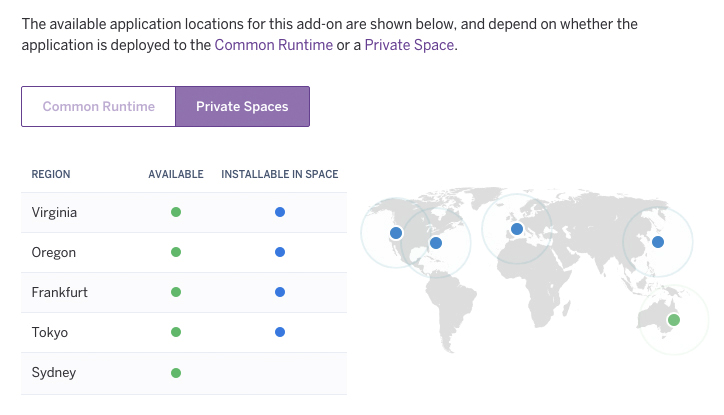 Private Spaces are currently available only in Heroku Enterprise. Private Spaces are dedicated environments for running dynos and certain types of add-ons within an isolated network. Access to apps in a Private Space can be controlled at the network level. Outbound requests from apps in a Private Space originate from a set of stable IP addresses, which allows you to securely communicate with IP white-listed services on-premise or on other networks. Private Spaces enable you to build and run Heroku apps that meet strict requirements for data protection and change control, as commonly required by corporate and regulatory governance standards. There are two types of Private Space: the standard Private Space and the Shield Private Space. The Shield Private Space includes additional features for building and running high-compliance applications. You can deploy to Private Spaces with the familiar git push heroku master command or take full advantage of Heroku Pipelines. The powerful governance and security features provided by Private Spaces do not change the standard Heroku developer experience. Only team administrators can create, destroy, or modify Private Spaces. All team members can view details about Private Spaces in the team. To create a Private Space in a given region, simply specify the location when creating the space. The region cannot be changed after the Private Space is created. All apps created in a Private Space are in the same region as the space. Heroku gives you more detailed information about each of these regions in the Platform API. For more information, see the Regions article. Not all add-ons are available in all regions. To view which add-ons are available in a region, see Add-on Runtime Availability. Only team administrators can create a new Private Space. To create a Private Space using Dashboard, click the Spaces tab inside your team and click Create new Private Space. When creating the Private Space, you can optionally choose a region (geographic location) for your apps and data services. When you fill out the form and click Create Private Space, your new space is created within ten minutes. To create a space with a custom dyno or data VPC CIDR range, the --cidr and --data-cidr flags can be specified. Private Network CIDR Ranges can currently only be customized when creating Private Spaces using the CLI, not in Dashboard. A /16 CIDR range is required for the dyno VPC (--cidr) and a /20 is the minimum CIDR range size for the data VPC (--data-cidr). We currently reject the usage of CIDRs that overlap with 172.17.0.0/16. All team members can view information about the Private Spaces in an team. In Dashboard, click the Spaces tab inside your team. The Space info displays the team to which the Space belongs, as well as the current state of the Space. The allocating state indicates that the Space is being set up and is not yet operational. When it becomes operational, the state will change to allocated. Only team administrators can manage trusted IP ranges for a Private Space. Each Private Space has a set of trusted IP ranges, with each range represented in CIDR block notation (for example, 192.0.2.0/24). Only clients originating from one of these trusted IP ranges can access web processes running in the Private Space. Use trusted IP ranges to restrict traffic to apps that come from your corporate network or from a CDN service that proxies traffic for your apps. When a new Private Space is created, it’s configured with a default trusted IP range of 0.0.0.0/0 which will admit traffic from the entire internet. Trusted IP ranges only restrict access to applications in the Private Space. They do not control from which source IP ranges you can execute CLI commands or connect to Dashboard. Trusted IP ranges can be managed in Dashboard by opening the Network tab for a Private Space. ▸    WARNING: It may take a few moments for the changes to take effect. To open up a Private Space to traffic from the whole Internet (the default for newly created spaces), add the CIDR range 0.0.0.0/0. This is a beta feature. Email postgres@heroku.com to have Trusted IPs for data products. Trusted IP ranges for data services are not available in Shield Private Spaces. 0.0.0.0/0 will be ignored as a Trusted IP for data products because this CIDR block would expose the database to the wider Internet. Granular controls do not exist. A Trusted IP will be able to reach both web dynos and data products. All team members can view the list of stable outbound IP addresses for a Private Space. All outbound traffic from apps in a Private Space will originate from a small, stable list of IP addresses that are dedicated to the space. This allows you to use IP whitelisting to secure services being accessed by apps in the space. For example, you can configure a web services gateway in your corporate data center to only allow access from the IP addresses assigned to the Private Space. By using this in combination with TLS and application level authentication tokens, you get an extra level of security for protecting resources in your corporate data center. Only team administrators can destroy a Private Space. Private Spaces that contain applications or other resources cannot be destroyed. Apps must be explicitly deleted before destroying a Private Space. In the Heroku dashboard, click “Space Settings” and choose “Delete Space”. A Private Space represents a trust boundary within which your team can deploy and manage apps that handle sensitive data. Therefore, the ability to create apps in a Private Space is constrained to team administrators and those who have been granted the “app creation” permission for a particular space. Once an app has been created, the administrator can give other members additional access to the app using fine-grained access controls. In the Heroku Dashboard, click on a space and choose Create New App. After the app is created, you can grant other team members access using one of several app permissions. Only members who are trusted to access any sensitive data protected by the space should be granted more than view permissions. All other members, who may develop on the app but who do not need production access, should only be granted access to staging and development environments. Code can be deployed (pushed) to Private Space apps in the same ways as with Common Runtime apps (such as by using git push heroku master or a GitHub integration). The build process itself occurs outside the Private Space and will not have access to any resources located inside the Private Space. The first time an app is deployed (pushed) to a Private Space, it can take several minutes for the app to become available because of the time needed to set up the underlying dedicated infrastructure (e.g., routing, DNS, and the dynos). For subsequent releases (code deployments or config var changes) there is a much shorter delay, and users may experience little to no downtime. There may be brief downtime if there is only one dyno for the app. If there are multiple dynos, zero downtime is possible. This is because of a Private Spaces feature called rolling deploys. Rolling deploys are analogous to Preboot on the Common Runtime. Both enable zero downtime during new releases. Preboot does this by ensuring that new web dynos are started (and receiving traffic) before the existing ones are terminated. Rolling deploys do this by stopping and changing only 25% (rounded up) at a time of the existing dynos in each of dyno types including web dynos and other worker dynos, while the remaining dynos handle requests and tasks. The effect is that all requests are handled (no user downtime) while the new release is pushed gradually to the entire formation. The app has been deployed at least once and is running. The app has at least two dynos and is not currently at capacity (that is, it has enough dynos that it can still service requests with about 25% of its dynos missing). Any databases attached to the app are not incurring schema changes and are compatible with both the old and new app release (forwards- and backward-compatible). Scaling an existing app in a Private Space does not incur downtime (as long as there is enough capacity to handle the existing load). Changing the dyno type does incur a short downtime, under some circumstances, while the new dyno types are created and traffic is switched over. Only team administrators and members who have manage permission on an app can add custom domains and manage SSL. Newly created Private Spaces apps get working HTTPS on <appname>.herokuapp.com a couple minutes after app creation and after apps are renamed. When enabling SSL for custom domains using either a manually uploaded certificate or ACM HTTPS will stop working on <appname>.herokuapp.com for Private Space apps. The default app domain (e.g. http://example.herokuapp.com) will always work with standard HTTP, but will not work with HTTPS if SSL is enabled for custom domains on the app. Apps in Private Spaces currently require TLS connections to use the SNI extension. Older clients that do not send the SNI extension will not be able to connect to a Private Space App using https. See the Custom Domains and SSL documentation for detailed steps. ▸    WARNING: Warning: Dynos can take up to a few minutes to be provisioned in Private Spaces. Scaling and one-off dynos require that a new dyno is provisioned and launched within your Space. This process takes a few minutes to complete. Shield Private Spaces include additional features for building high-compliance applications. See the Shield Private Space article for details on features. If you attempt to provision an add-on for an app in a Heroku Private Space and that add-on is not available in that app’s Private Spaces region, you will see a message saying so. To view which add-ons are available in a region, go to the Add-on Runtime Availability. Select the Private Spaces tab to view information for Private Spaces regions. You can also view this information in the Region Availability section of the Elements listing page for each add-on. Many add-ons offer plans that are compatible with Private Space regions, even though they operate outside the Private Space. This means that network traffic between your private dyno and the add-on resource travels across the public Internet. These add-ons are marked as “Available” with a green dot in Add-on Runtime Availability. Use `heroku addons:docs newrelic` to view documentation. Some add-ons of type “datastore” are compatible with Private Spaces regions. They can be provisioned through the CLI with the addons:create command, or they can be provisioned in the Dashboard. Either way, you will have to confirm that you understand that this use of a data store not contained within the Private Space network boundary is explicitly intended; that using this add-on plan will send data over the public Internet.
! This add-on is not automatically networked with this Private Space. Some add-ons are installable in Private Spaces. This means that all network traffic between dynos and the add-on resource stays within the private network of the space, and the add-on resource does not have to be exposed on the public Internet. These add-ons are marked as “Available & Installable in Private Space” with a blue dot in Add-on Runtime Availability. Heroku Postgres and Heroku Redis are examples of add-ons that are created inside Heroku Private Spaces. 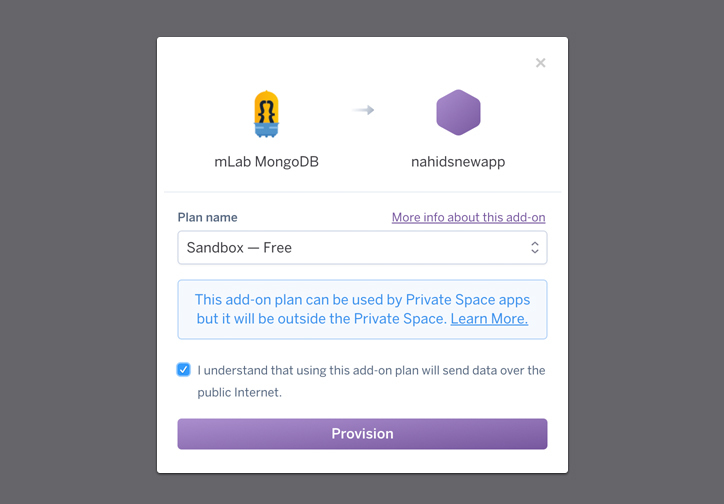 When you select a Heroku Postgres or Heroku Redis private plan for an app in a Private Space, the resource will be automatically created in the same region as the Heroku Private Space and peered to the Heroku Private Space. To create a Heroku Postgres instance inside your Heroku Private Space, you must select a private-0 plan or above. Since this Add-On will be automatically created inside your Space, confirmation is not required. 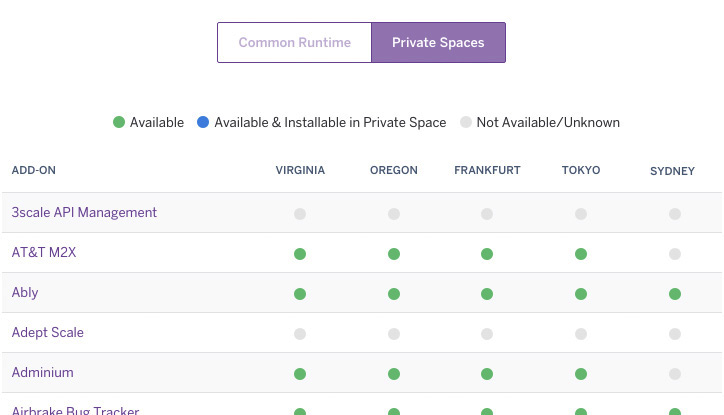 See the Heroku Postgres and Heroku Private Spaces and Heroku Redis and Heroku Private Spaces articles for more information. It is possible to provision Heroku Postgres and Heroku Redis plans outside of your Space. Provision by specifying app, plan, and region using the --region flag. You will be asked to confirm the addition of the plan via the CLI. There is no automated feature, at this time, to migrate apps and data to or from a Private Space, but it can be done manually. You should first back up and migrate the database(s), if any. App code should then be re-pushed to the destination. You should also consider differences in the way Private Spaces operate and whether any add-ons the app uses will work or need to be configured differently in the destination. For instance, SSL for apps in Private Spaces works slightly differently. Private Spaces Runtime are built on a different architecture than the Common Runtime, and Private Spaces has different default limits. To have limits increased for any of your private spaces, please open a support ticket.